The comment is signed with some use name. So probably from the comment itself it is not clear whether it was added by some (at least partially) automated process. However, I am not sure exactly in which situations such comments appear. I decided to ask here rather than experiment, since I do not want to flag some post by mistake. And also low quality posts review queue is empty at the moment, so I cannot experiment there. I think that knowing exactly when this happens might be useful for some discussions which are currently going on. Do some flags cause addition of such comment? Namely if I flag some post as "not an answer", is such comment added? Do I have option to decide whether it is added, when I use this type of flag? Are there some other situations when such comment is added by the software? Just to clarify, I am asking only when such comments is added by the SE software. Of course, nobody prevents a user from typing such comment manually, add them from some comments repository using some bookmarklet or userscript, or simply copy similar comment from here. 1 I have copied the text of the comment from here. (A deleted post, so it is visible for 10k+ users only.) I cannot know for sure whether it was added by software or actually typed in by a user, but the first possibility seems much more likely, since I found the post from Low quality posts review history. Is it only added when I choose "Recommend deletion"? Yes. But even then not always. If I choose this option, is there some possibility for me to choose what auto-generated comment is displayed and whether it is displayed at all? Yes. After pressing "recommend deletion" there is a pop-up with a list of six options (see below). The first and default is "no comment needed" the rest are some typical scenarios with a standard comment, one of them is the one you quote. If one chooses one of those the comment will be added (except if it is already present, from an other user, I think). Do some flags cause addition of such comment? No. The flag just puts the answer in the queue. Namely if I flag some post as "not an answer", is such comment added? Do I have option to decide whether it is added, when I use this type of flag? No. It is never added. Here is the text of the pop-up I talk about. Add a comment for the author? Leaving a comment is optional, but can help the author learn how to improve their post or avoid making the same mistake in the future. The bullets are selectable items; the default is "no comment needed." 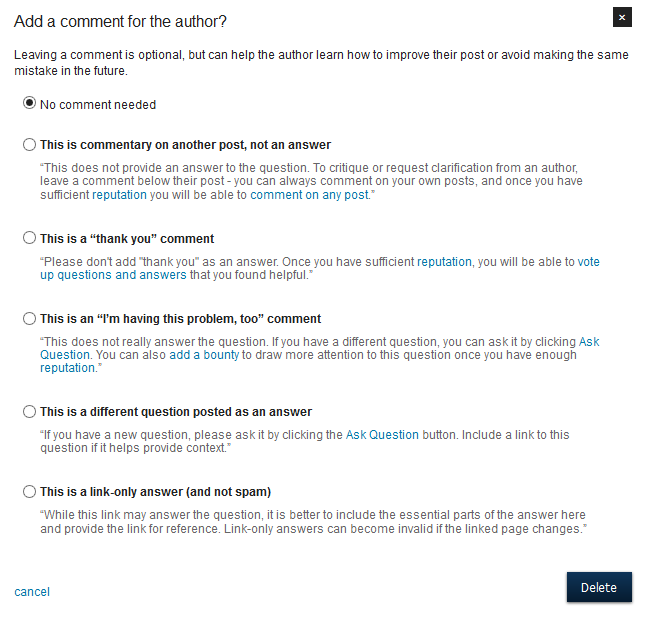 Note the first comment is slightly different as it depends on the points of the answerer; users with the comment-privilege do not get the remark that eventually the will be able to comment, which is reasonable. Not the answer you're looking for? Browse other questions tagged support comment flagging low-quality-posts . Etiquette for flagging a comment that points out a (corrected) typo?